Judtson Kent is a professional skeptic. In fact, he has made millions writing books debunking the myths and ridiculing the proponents of everything from Illuminati conspiracies to alien abductions. Then one day he is confronted with evidence...undeniable proof even he cannot refute. His world and belief system turned upside down, Judtson suddenly finds that his mind is slowly, inexorably losing control. As Saylor Costello, a neurologist and Judtson's lifelong friend, battles the inexplicable mental transmutation, he discovers that several others around the world...others who are all on the verge of earthshaking discoveries are suffering from the same symptoms. 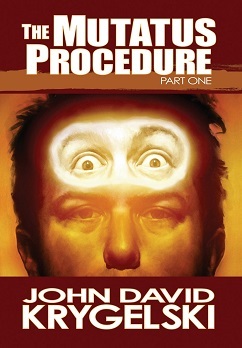 In John David Krygelski's fourth novel - The Mutatus Procedure (Part One) - the reader will be pulled into a world where nothing is as it seems, even consciousness itself. The Mutatus Procedure is a blockbuster that takes you by the scruff of the neck and thrusts you forward at breakneck speed until it drops you off exhausted on the last page. In an incredulous story, Krygelski blows away the myths of the little green men, the moon landings, and space ships in Roswell that we have been fed for generations. Whether you are a believer in all things alien or a skeptic, you too, will be highly entertained and swept along with this magnificent tale of David and Goliath proportions. The Mutatus Procedure is the very best book I have read in the past ten years or so. It ranks right up there with Amazonia, by James Rollins. Your way with words in describing the scene are very catching to the imagination and it is nearly impossible to put the book down, once you get into it. I've thoroughly enjoyed all of your books and am looking forward, with great anticipation, for Part Duo to come out. Keep up the good work.